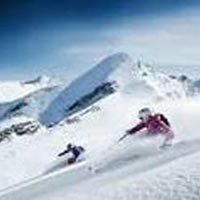 During the program you will learn the basics of skiing and get to practise the skills you pick up on slopes of varying gradients. Keep in mind that as a beginner you will fall down a lot while practicing, but don't lose hope. Given proper training and instruction on this sport it is not that difficult to learn. 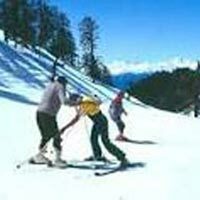 You will be picked up from Haridwar and after 280 kms drive through the scenic Garhwal Himalayas, you will reach your skiing destination Auli in 7-8 hours. You can relax at the clean and comfortable guest house. After an early breakfast, you will be introduced to our experienced skiing instructors. 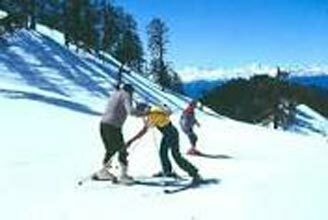 They will ensure that you learn the basics of skiing during the course. You will slip, slide, fall and bang but have a lot of fun. You will learn ‘walking’ all over again, as doing it on snow with skis is a totally different experience. You will also pick up some key sliding techniques over the beautiful snow clad earth. At the end of an eventful session, the most important thing you will understand is learning from your falls. Today is same as the previous day, you’ll just fall less, we guess. After a round of instructions, you begin to balance on the skies. You will now be able to stand on the skis and learn to apply breaks on your own. The first few rounds will all be about crash landing at the end of the slope. Mind you, these sessions will also be marked by many fall and recovery incidents. It’s the day to move ahead. You learn how to move forward on a gentle slope. You will perfect your parallel turns and snow plough turns. The snowplough turn is a braking and turning skiing technique, usually taught to beginners. The front tips of the skis are brought together and the tails pushed wide apart, with the knees rolled inwards slightly. By applying pressure against the snow with the edges of the skis, speed is reduced and the skier can stop completely. Here’s the final day of skiing and your chance to show-off your mastery with the skis. Your instructor will take you to an advance slope. This slope is much longer than the beginner slope, and you will definitely gain a lot of speed while sliding on it. 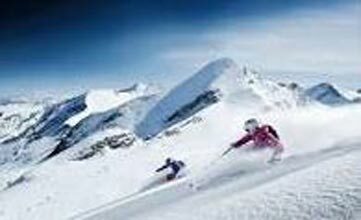 Your instructor will be with you for the entire duration to help you perfect your ski runs. Once perfected, you’ll be honoured with a certificate of appreciation. After an extensive learning programme, you plan your trip back. We’re sure your freshly carved ski lines will be a part of your most cherished memories. And you’ll return to experience ice cold winds running through your hair and powdery snow flakes caressing your face, once again.